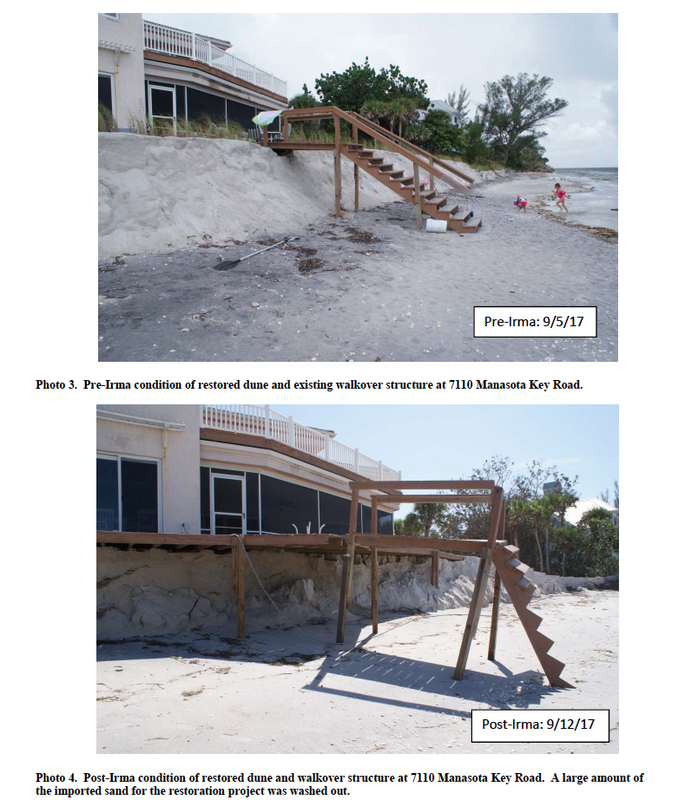 Having heard from almost a dozen Manasota Key residents alarmed about worsening erosion on their beachfront property, the Sarasota County Commission this week voted unanimously to pursue one renourishment project and to ask staff to undertake further research for a second one. The option the board approved, on a motion by Commissioner Alan Maio, calls for Sarasota County to partner with Charlotte County on a combined initiative — dubbed Option 2 by staff. It will help 50 Sarasota County owners of property on the Gulf of Mexico on Manasota Key. The approximately $35-million undertaking is planned to start as close to Nov. 1 as possible — after sea turtle nesting season ends. It would cover 4 miles of beach, from Blind Pass Beach Park south to Stump Pass Beach State Park, including Englewood Beach Park. Sarasota County’s portion of the expense will be about $8.1 million, Matt Osterhoudt, director of the county’s Planning and Development Services Department, pointed out during an April 9 presentation to the Sarasota County commissioners. Michael Poff, president of Coastal Engineering Consultants of Naples — the Charlotte County consultant who has worked on the project — told the Sarasota and Charlotte county commissioners during a joint meeting in late February that Sarasota County would get about 300,000 cubic yards of sand, while the Charlotte County side of Manasota Key would get approximately 580,000 cubic yards. The second part of Maio’s April 9 motion — which Detert seconded — calls for staff to investigate the expense of a project north of Blind Pass Beach Park. It would not cover as much distance as an undertaking, dubbed Option 3, that Poff had discussed during the joint meeting in February. On April 9, Osterhoudt referenced Poff’s suggestion that Option 3 go as far north as 7250 Manasota Key Road, which is approximately the same location as R-170, a geographical marker designation. The initial step Maio sought in his motion is for staff to explore the expense for renourishing the beach in front of the first six homes north of the park; then, staff could consider the cost of adding the next three. 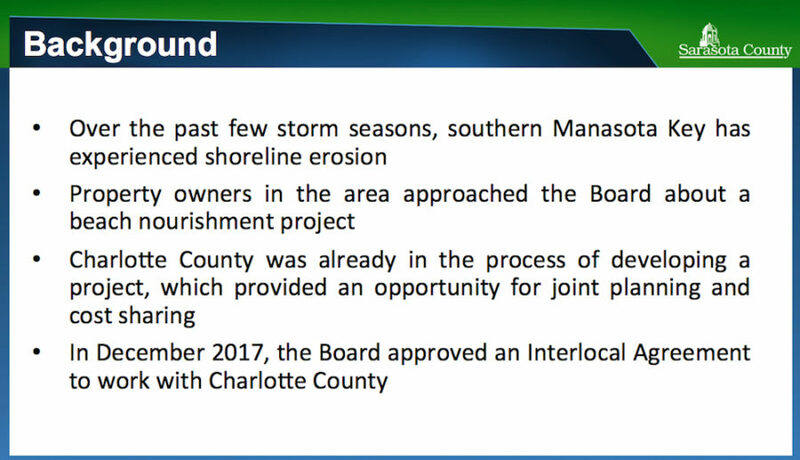 During his remarks at the joint Sarasota/Charlotte board meeting on Feb. 28, consultant Poff explained that, because of the exposure of hardbottom on the northern part of Manasota Key in Sarasota County, the expense of a project would be much higher there. “It’s too great of a resource,” Poff said of hardbottom. State and federal environmental agencies will not allow it to be covered with sand, he added. During that Feb. 28 meeting, Poff suggested options for renourishment north of Sarasota’s part of the joint project area. Beach berms could range from 20 feet in width to 50 feet, he said; the sand would have to be trucked to the site. The first six houses north of Blind Pass Beach Park have no beach hardbottom issues, Maio pointed out on April 9. 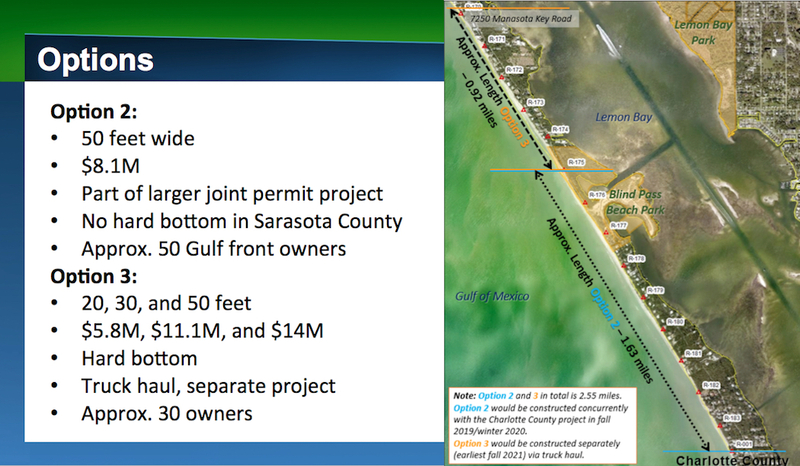 Showing the board a slide, Osterhoudt said the range in cost for the options Poff presented for a more expansive northern project on the Sarasota County side would be $5.8 million to $14 million, with about 30 property owners getting a wider beach. “Option 2 needs to roar ahead,” Maio said after making his motion. Even so, as Commissioner Michael Moran pointed out, staff will be working within tight time constraints to complete all the necessary steps. “There’s obviously a sense of urgency here,” Moran said, because the joint project has to be completed before turtle nesting season begins again on May 1, 2020. Additionally, Moran noted — reprising comments Poff made on Feb. 28 — “only a few companies in the world” handle dredging projects. Osterhoudt said he felt staff “could move forward expeditiously” to conclude the necessary new interlocal agreement with Charlotte County for the joint project. However, he indicated that the more intensive aspect of the initiative for staff would be “a lot of engagement and education with the property owners” on Manasota Key who will be affected by the renourishment. Staff will have to obtain construction easements over private property for the work to proceed, Osterhoudt explained. Nonetheless, Osterhoudt continued, “We had to do the same thing on South Siesta Key,” when the county undertook two renourishment projects there. “We do believe we can get this done,” he added. 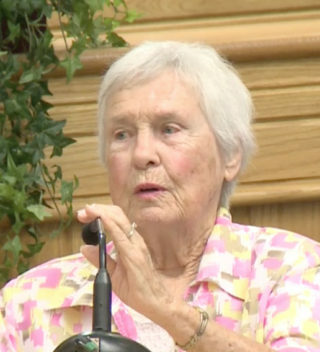 The situation is the same in her situation, Gay Walker said, noting that her family has owned its property on the barrier island for the past 32 years. Originally, she added, the beach was 100 feet from the house. When he moved into his Manasota Key home in the 6800 block, Larry Reister said, the beach had 90 feet of berm and then another 15 to 20 feet of public shoreline. With the series of storms that have assaulted the island in the last three years, especially, he added, about 25 to 30 feet of sand has disappeared from beneath his house. Moreover, he continued, turtles have been nesting near his property for the past 10 years. However, the beach has become so narrow, he said, the Gulf swamps the nests. “Unfortunately, our beaches are shrinking and overcrowded,” added Charles Miller. “This will only get worse as North Port continues to grow and develop,” along with the West Villages communities, he told the board. Renourishing the area even 350 yards north of 7250 Manasota Key Road, she added, would help the owners of the properties with the most serous erosion. The Florida Department of Environmental Protection (FDEP) has issued its formal Notice of Intentto award the Joint Coastal Permit for the Sarasota-Charlotte initiative, Osterhoudt explained to the commissioners. Additionally, Charlotte County has applied for a state grant out of money designated annually for beach renourishment projects; funding has to be appropriated each year by the Legislature. The Sarasota-Charlotte project is third on the list, Osterhoudt noted. During the Feb. 28 meeting, consultant Poff said that if Sarasota County agreed to participate in the project with Charlotte, Sarasota County would become eligible for the state to pick up 36% of the expense of the work — the state share he had been advised to expect. Legislators have assured Sarasota County commissioners that the grant money will be coming to the joint project, Chair Charles Hines said on April 9. As for undertaking a project north of 7250 Manasota Key Road: Where would Sarasota County get the $14 million if it opted for a 50-foot-wide beach, Detert asked. 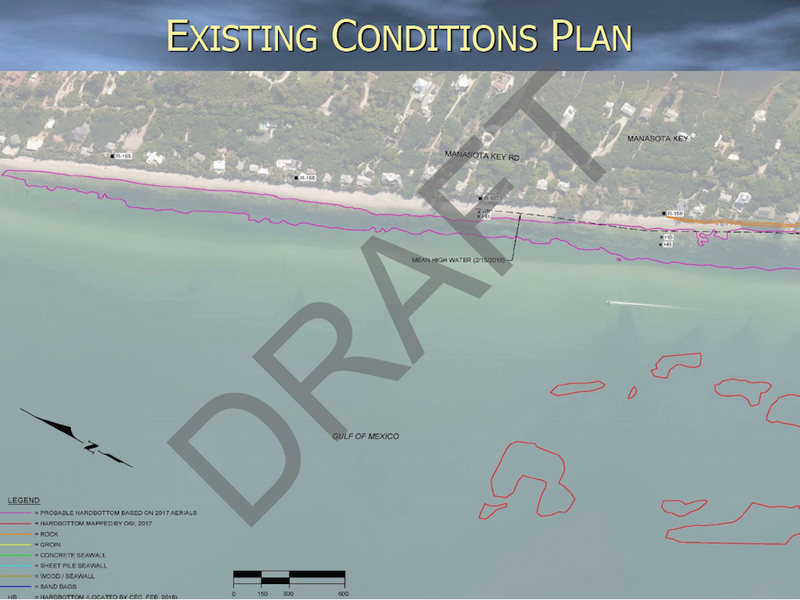 With the most recent South Siesta Key Renourishment Project, in 2016, the county received state grant funds that covered about 40% of the approximately $21-million expense, Osterhoudt replied. 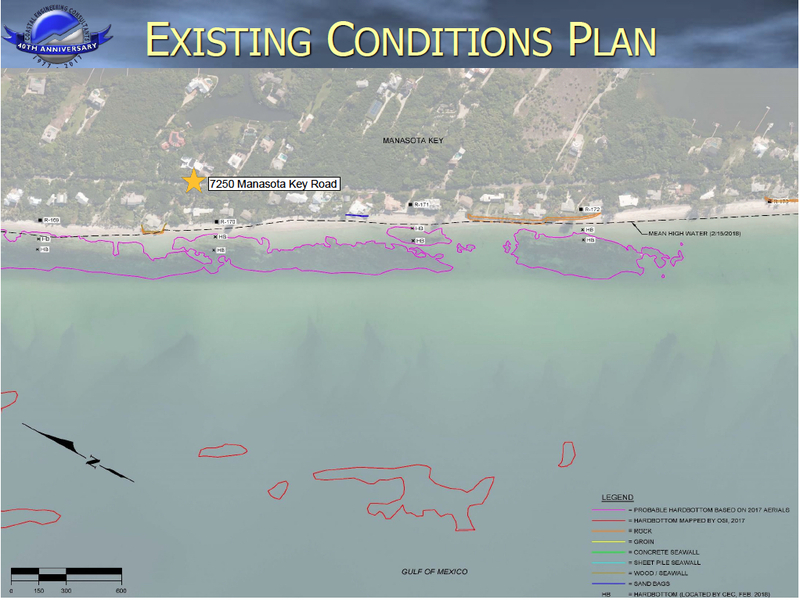 The county also could see state assistance for Option 3 on Manasota Key, he noted. Other funds would come from Tourist Development Tax — “bed tax” — revenue set aside for the county to use in beach renourishment projects, he continued. Finally, with the South Siesta undertaking, he explained, staff used a Municipal Services Benefit Unit (MSBU) funding source, through which property owners are picking up about 17% of the expense. They pay an annual assessment that is included on their tax bills. If the board ends up pursuing a limited project north of 7250 Manasota Key Road, Osterhoudt pointed out, the MSBU would involve just the affected property owners. “So we could give you a big ‘Yes’ to Option No. 2” and then ask staff to work on strategies for Option 3, Detert asked. That was correct, he replied. 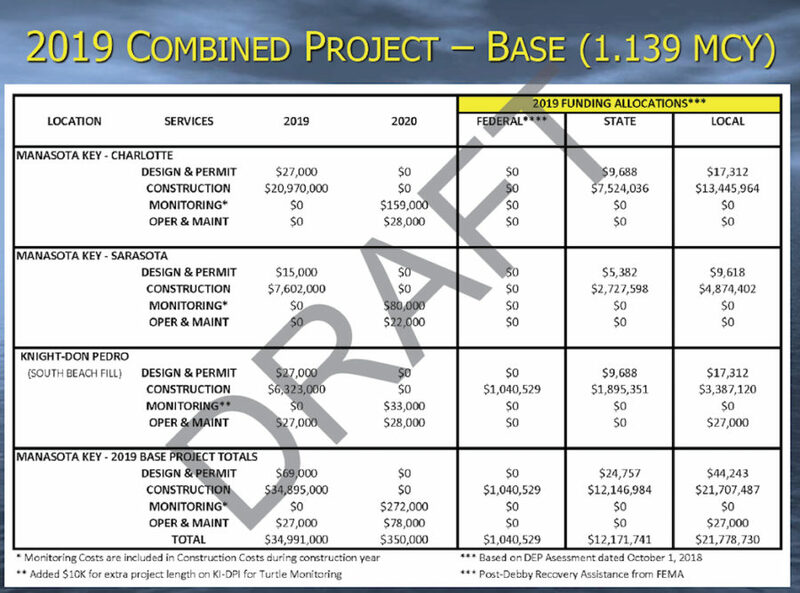 Detert also pointed out that if the county ended up spending $14 million to renourish the beach under the full version of Option 3, the sand might not stay in place two years. She joked that it might make more sense for the county to help the City of Venice with another beach renourishment initiative, and then the Manasota Key residents could enjoy the accretion of sand as it flowed off Venice’s beaches and headed south to Manasota Key. A few members of the audience laughed.